If you need extra workspace in your kitchen you will love these cherry kitchen islands. Come browse and see which one you can’t live without. 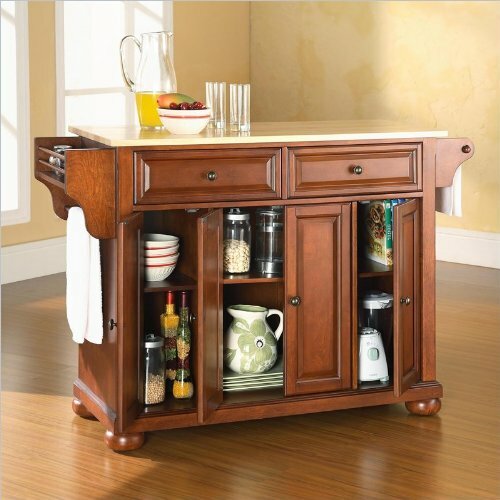 You’ll love the variety of cherry kitchen islands showcased on this page. With this great selection, you should have no problem finding exactly what you need. Some styles are produced with a variety of tops so you can purchase the cabinet you like with either a wood top, stainless steel or granite… whatever suits your taste and decor. 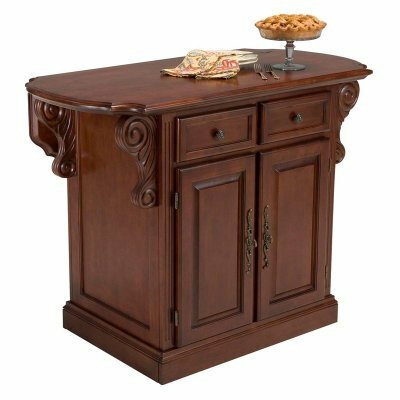 These cherry kitchen islands are not only useful and practical, but they are decorative, too, and will give your kitchen a new look. Some of these kitchen islands also come on casters so they can be easily moved around to suit your needs. I have also found some smaller kitchen carts that you may find useful. 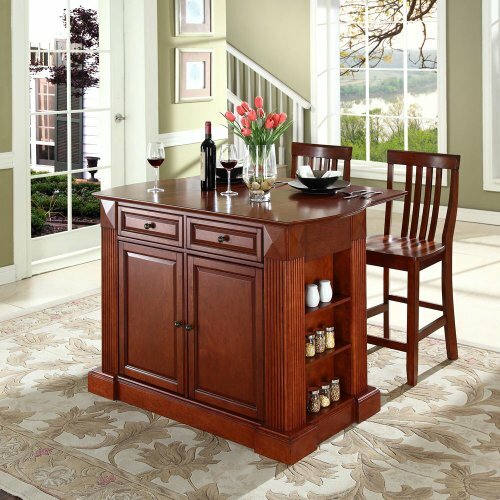 These fabulous cherry kitchen islands are a wonderful way to add work space or a breakfast bar to your kitchen! This island has antiqued brass hardware and a hand rubbed cherry finish. The top is solid wood. As you can see it has lots of storage space and glass doors so you can show off your prettiest serving pieces. The handles also serve as a place to hang a kitchen towel. I love the look of this beautiful set. This cherry kitchen island comes complete with two matching chairs, so it is perfect for use as a breakfast bar, or the perfect place for company to sit and chat while you finish preparing the meal. I could even see it being used as a bar area for serving cocktails or wine. If you love contemporary decor with simple, clean lines, this designer cherry kitchen island is for you. 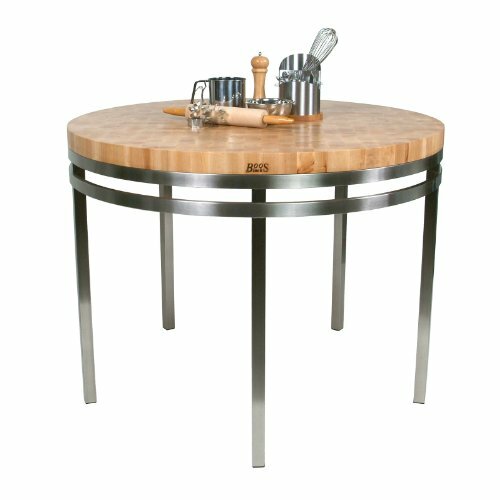 This neat 36″ round kitchen island is done in a natural and cherry finish. The rounded lines and smaller size make it perfect for the smaller kitchen. Or use it in a corner of the dining room for serving drinks. 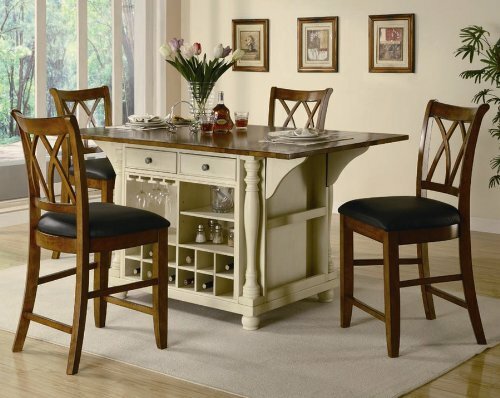 The furniture style would blend well with your cherry dining room set. 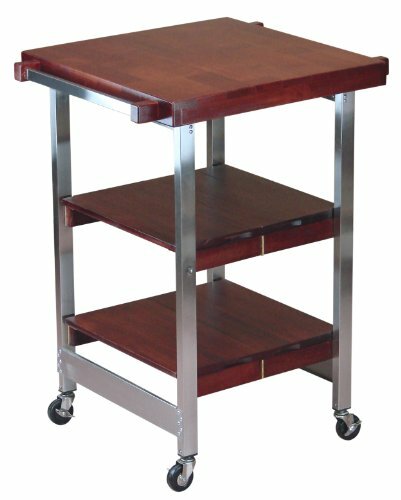 Here’s the cherry kitchen island cart with a stainless steel top, for those that like the practicality and look of stainless. The island measures 18x52x36. It features hand rubbed cherry finished hardwoods and veneers with raised panel doors. This cherry finished Asian hardwood island sports a fold down breakfast bar. It is 48″ wide and 36″ high. You can purchase it with or without the matching chairs. If you love antiques or old furniture styles as I do, this one my be for you. This set really appeals to me. It blends the dark wood finishes with the white painted wood – both looks I love. In recent years, home decorators have begun mixing colors in the kitchen. Instead of having all the cabinets of the same color, they will now have one or two pieces in a contrasting color. The kitchen island is a great place to add the contrasting color. For those with a white kitchen decor who want a bit of color, this island with the cherry finished top and matching chairs will be perfect. This beautiful white kitchen island with cherry top, has 4 matching cherry finished chairs to use when the breakfast bar is expanded. The island measures 42x42x36. It also has a built in wine rack! This beautiful white kitchen island with drop down breakfast bar top in cherry finish comes with two cherry finished stools. This shuttered style kitchen island is made of white and cherry finished Birch hardwoods and veneers.White finish with a cherry finished top. Three adjustable shelves behind the four doors. 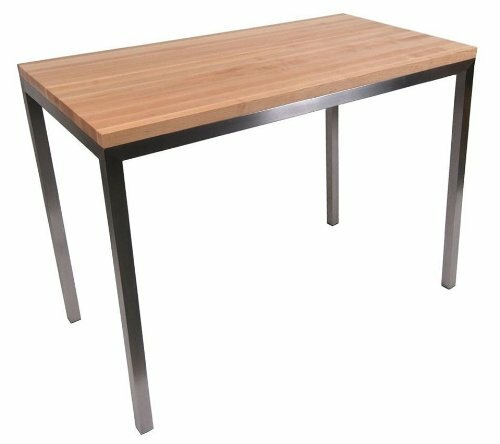 If the industrial or minimalist look is your style, this rectangular cherry kitchen island will probably be more to your liking. The mahogany wood and veneers are cherry finished. This beauty is 18x52x36 and sports a black granite top, hand rubbed cherry finish, and raised panel doors. 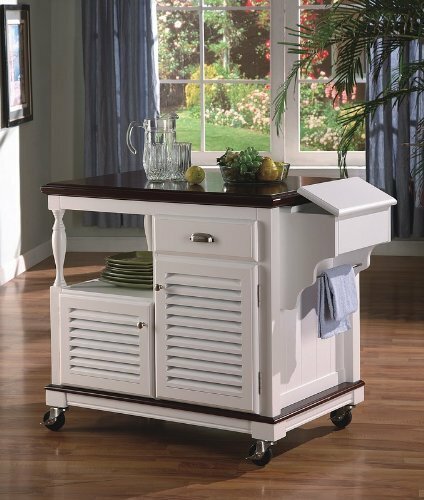 These cherry kitchen islands and carts are the same models as above but have a granite top instead of a wood top. 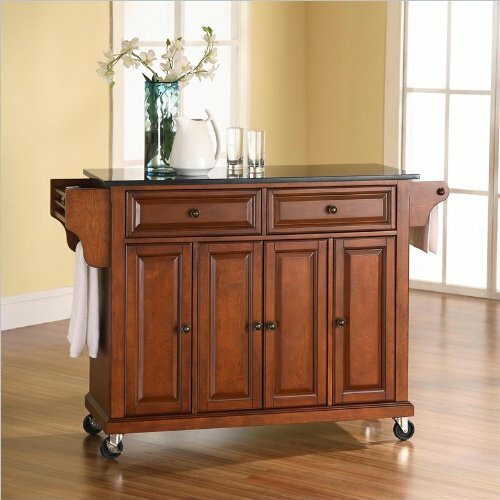 If you don’t have the space for a kitchen island, these smaller kitchen carts may meet your needs for extra work or storage space.They roll around easily to accommodate your work space needs. 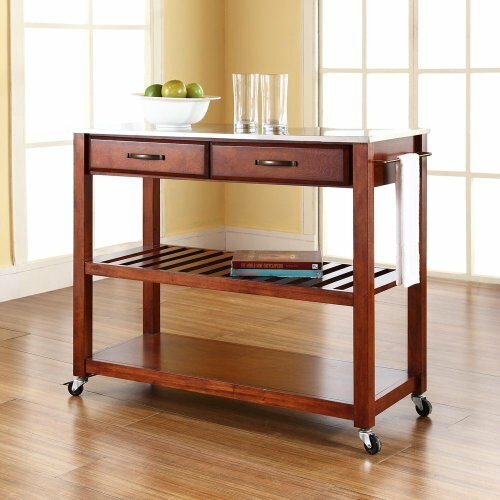 The serving carts are pretty enough to leave in a corner of your dining room and great for serving drinks or desserts.